Two Rushden families were united by the wedding on Saturday at St. Peter's Church of Miss Margaret E. Brooksby and Mr. Eric Sail. 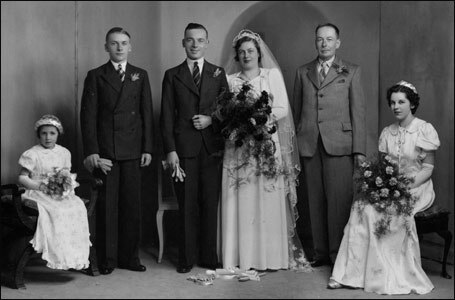 The bride is a daughter of Mr. and Mrs. J G. Brooksby, of 6, Pemberton-street, and the bridegroom is the eldest son of Mr. and Mrs. G. Sail, of 39, Crabb-street. The bride was given away by her father, and wore a dress of creamy white crepe with veil, and a headdress of orange blossom. Her bouquet was of red carnations and heather. Her attendants, Miss Grace Brooksby (sister) and Miss Barbara Potter (niece) wore ankle-length dresses of white and flowered romaine. They carried pink carnations and wore gold bracelets which were gifts of the bridegroom. The best man was Mr. George Sail, brother of the bridegroom. Mr. J. Lindsay Clipson, A.R.C.O., was at the organ and accompanied the hymn ''Lead us, Heavenly Father, lead us," also playing the "Bridal March." The ceremony was conducted by the Vicar, the Rev. Edwin Hirst.